Bon Iver's Justin Vernon holed up in the north Wisconsin woods to try to get his life and his music back on track ... and, in the process, almost by accident, made one of this year's most hauntingly beautiful folk-rock albums. 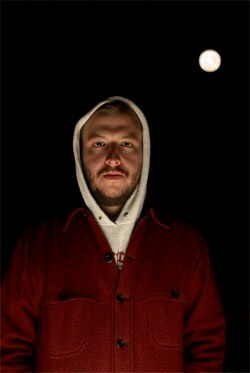 Justin Vernon wasn't planning to make an album when he hauled his worldly goods from North Carolina to his father's hunting cabin in northern Wisconsin. No, he was in retreat from a failed move to North Carolina, the break-up of his ten-year-old band and the sense that his life had somehow jumped the tracks. He had a guitar with him, as always. There was some recording equipment in the trunk of his car. 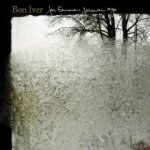 But the idea of making an album, let alone an album as radiantly, spectrally beautiful as Bon Iver's For Emma, Forever Ago, never entered his mind. "I was just sort of escaping a bit and thinking about what I was going to do," he said in a recent phone interview. "I went north to my dad's hunting cabin, just to sort of 'be' for a couple of months." The story started a year and a half previous, when Vernon's old band had moved, en masse, to North Carolina in an attempt to break out of a fairly small local scene. It was a fresh beginning that was supposed to kickstart the band's creative process, but, for Vernon at least, it turned out to be a dead end. Vernon, who had been making ends meet teaching guitar in Wisconsin, had to work long hours as a cook to make rent in North Carolina. "I felt very isolated, but without the benefit of having true isolation, because I was always around my friends," he said. "I was in a new place, and it was very hot and very uncomfortable. I was a little bit homesick as well." Even worse, his relationship with his bandmates was more confrontational. "We had been together for ten years, and as soon as we got down there, musically we had started to disagree on things." Vernon began to doubt himself, as well. "I think that musically I realized I was compromising a lot," he said. "It wasn't anybody else's fault but mine. I had compromised so much for so many years, and on a personal level, too, I'd compromised a lot. Not morals, but just thoughts in general." He added, "That's kind of the story of the record. For five or six years there, I went from where I really thought I had purpose and something to do and to give or to be and to feeling really mediocre. It was like a weird spiraling mediocrity thing." So Vernon went to his dad's cabin on 80 acres of woods to think things over. Then one day, in the dead of winter, some ideas he had been working on in North Carolina came back to Vernon, and he dug out the recording equipment that had been sitting in his car. "I'd sleep in the cabin and make food in there and do chores outside, and a couple of weeks down the road of being there by myself, I'd grab the stuff out of the car, because I had an idea and it never went back into the car, I guess," he said, still clearly bemused by the whole chain of events. "I dug out the songs again, the couple of ideas I'd started and then wrote more songs and basically I was up there for three months." Being isolated for three months in a wintery cabin with only a woodstove for heat and only a DVD set of Northern Exposure for entertainment might bring out the Unibomber in some people, but for Vernon, it was a strange, indescribable creative awakening. "It was all kind of hazy. It all sort of melted into ... one day turned into another. I don't recall a lot of very concrete memories of it, because I think I was a little bit out of my head, a bit," he remembered, adding, "When I was done, I had a group of nine songs. I didn't know exactly what they were, but things grew from there." What they were, it turned out, was For Emma, Forever Ago, a haunting slice of time out of time. As a record, it has captured the imagination of a wide swath of people who will never set foot in a hunting cabin, and Vernon thinks that maybe that's because of certain unspoken longings -- for peace, for stillness, for time to think -- that even the most plugged in and sophisticated of us sometimes feel. "Maybe the whole thought of going to a cabin for a few months is something that people relate to as they hear the songs," said Vernon. The album has an otherworldly shimmer to it, thanks to high, delicate vocal harmonies and feather-fine arrangements. Vernon says that he listened to very little music while making For Emma but may have been influenced subliminally by sources as disparate as choral church music and Appalachian folk. "Lump Sum", for instance, starts off with an eerie, minor key interweaving of voices, more midnight mass than indie rock, before it picks up the insistent rhythms of acoustic guitar. Vernon admitted that that's no accident; he had been listening to a fair amount of Vienna Boys' Choir recordings before heading off to the woods. "I love that sort of high, glassy, it's really painful sounding stuff," he said. "About a year ago, I started making choir arrangements just on my recordings, with my four-track, and it's sort of infiltrated into the songs." Vienna's Boys sing in the upper register because their voices haven't changed yet. Vernon, by contrast, performed much of the album in falsetto, another factor in its distinctive, otherworldly sound. "That was definitely something new for me," he answered, when asked about the high singing. "With the other band, I sang everything in a pretty low voice ... very confessional, very obvious." "The falsetto stuff, it must be a reaction to the black gospel singers that I really enjoy listening to," he continued. "Like the Staple Singers, Mahalia Jackson, and Sam Cooke. I was never really able to sound authentic, in my own ears, singing with that kind of voice before. It's not that I do now; it's just that I felt more comfortable singing certain phrases and certain painful combinations of notes with that voice. It wasn't a conscious decision at all. It just sort of happened." There's a hint of gospel and soul then, coming through the falsetto, and also perhaps an intimation of other kinds of traditional music as well. "Those old Appalachian singers use a falsetto sometimes, too," Vernon said. "They can change their voices to sound high or low or really scratchy. When you're singing, usually you're trying to express some kind of pain or joy. I think that voice allows me to do a lot more of that." But mostly, Vernon thinks that For Emma sounds the way it does because he was so far removed from his influences. For him, this was the record where he finally got away from touchstones like Tom Waits, Patty Griffin, Bob Dylan, Bruce Springsteen, and Neil Young and learned how to sound like himself. Vernon emerged from the woods with most of a new album in hand in February, spent a few days recording additional parts (the brass in closer "Re: Stacks" primarily), and then went back to North Carolina. He'd been asked to play guitar with the Rosebuds, who were set to tour through the spring. Vernon traveled as far as Moscow with the Rosebuds and got to open for Yo La Tengo, but maybe the most significant thing happened at SXSW. There he asked if he could try out a few of his own songs before the main set. 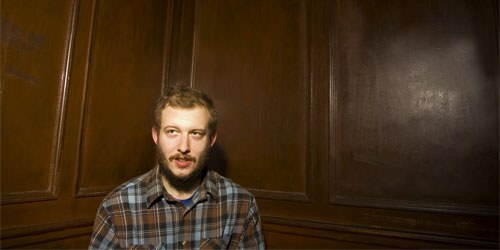 That was his first solo show, though he hadn't yet thought of the name Bon Iver yet. A few more followed that summer, one in New York and a couple in Wisconsin. Vernon made copies of his CD and circulated them. 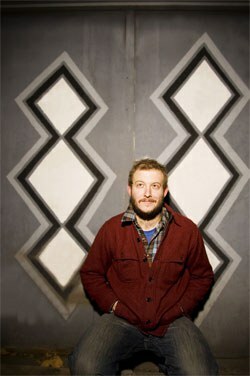 A trip to CMJ brought him to the attention of the blog world, and (Stereogum named that show one of his "30 best of 2007", and Bon Iver joined the Jagjaguwar roster in late October 2007. With album slated for release in February, Vernon is getting ready for a tour. He's working with new band members Mike Noyce and Sean Kerry to adapt his one-man-band songs for live performance. Both are locals -- Noyce a former guitar student, Kerry an ace drummer in the nearby college's top jazz band. "Sean came up to me at my first gig in July, and said, 'Hey, I play drums, and I've learned all your songs, and I know all the lyrics,'" Vernon recalled. "So I was like, eh, I'll try this guy. The first time through, he played every note and every beat with me and sang all the high parts." So, how does Vernon feel about performing these very personal, very of-a-particular-period-of-life songs over and over again, once he goes on tour? Just fine, actually. "I'm really enjoying things right now," he said. "It's weird that I'm still behind these songs. It's weird that I'm still able to float with them and be with them and find new and old pain in the song. The fact that they haven't just run their course, that they're not old hat after a year is really exciting. I'm very on the cusp of a new sort of thing right now. I'm really in it, and I don't want to be out of it. I don't want to jinx it."